The Extended DISC personality profile analysis is a nonjudgmental assessment providing insight into Behavioural styles in relation to people, situations and the environment that one is in. Extended DISC is an effective tool to be used as a confirming indicator of performance in the job selection process. Extended DISC is a powerful system for team building. It can be used for building and choosing team members and to help teams as a whole and/or individual team members become more effective. Extended DISC is a useful tool to help people become aware of their strengths and areas for improvement. By using Extended DISC we are able to help an organization determine the true strengths of each team member/employee and where they can be better aligned to utilize those strengths. Extended DISC Job Analysis is designed to provide information that makes an impact, is actionable and, most importantly, improves the performance of an organization. It allows the users to identify and to prioritize the behaviors for specific jobs that will produce the best results. The results are specific to their organization. Job Analysis is designed to ensure that reasonable and realistic expectations are created. One of the key success factors in any restructure is ensuring people are engaged, focused and confident that it will be successful. However, few organisations invest the time and effort to understand what their people are thinking. Organisational change inevitably brings ambiguity and uncertainty that can lead to a loss of performance and organisational confidence. We help organisations keep hold of talented people, reduce overall staff turnover and ultimately make organisations become more efficient and competitive. 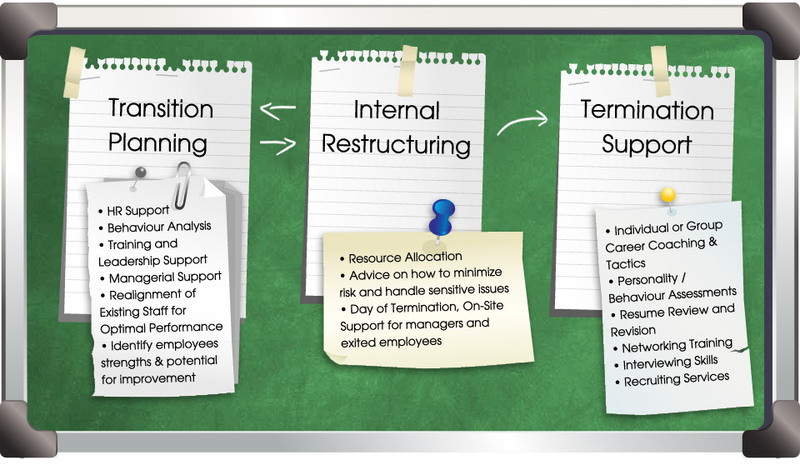 Outplacement programs optimize your corporate integrity by ensuring a positive change procedure during restructuring, downsizing, exiting or terminations. We are partnered with an employment firm, providing your exiting employees with a successful, results-orientated outplacement program to help them gain employment quickly. We offer Outplacement programs developed for all levels of employees, ranging from non-managers to C-level executives. Summit Employment Solutions is a 100% committed to providing outplacement services and programs that are tailored to helping personnel gain employment quickly and professionally. Our Outplacement coaches and consultants realize that corporate cut backs and terminations can dramatically increase uncertainty to the remaining employees, causing decreased performance temporarily or even permanently. However, by providing an effective outplacement service to the displaced employees (in combination with providing our Transition Planning to the existing team members), you can decrease anxiety with the remaining staff members to improve overall morale, production, and goodwill, as well as maintaining your reputation.